Headlines and news channels everywhere have already covered how bad this flu season is–even if you are healthy enough to stay out of the hospital, expect two weeks of downtime, plus longer lingering symptoms before you make a full recovery. With the stakes high, make sure you’re doing everything possible to avoid getting sick, including optimizing how you’re using your immune supporting colloidal silver. First, make sure you’ve got basic flu prevention covered: wash hands frequently (all day long for everything), run a humidifier to decrease transmission, stay on top of health basics like enough sleep, good nutrition, and fighting stress, and keep taking colloidal silver as daily immune support and adding it to your neti pot. Then you can do a few more things, like a sinus flood, or preemptively doing a little nebulizing. One of the biggest health risks from the flu is how it can get your lungs (either directly, or from a secondary infection like pneumonia). Staying ahead of it is a good idea this flu season. Although hospitals hand out prescriptions to go with nebulizers, you don’t need (or want) to start with steroids. Instead, start with colloidal silver. As long as you don’t have a silver allergy, it’s a safe, easy choice. 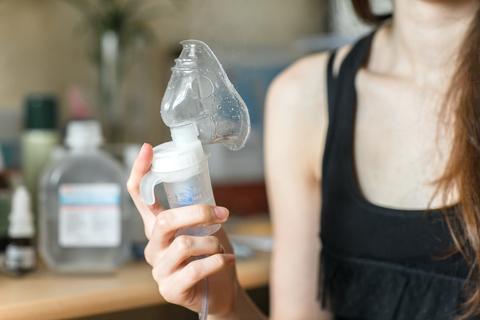 What can go in your nebulizer is a more exclusive list than what can go in your neti pot—you can’t boil and cool your own water, for instance. It has to be properly purified. Colloidal silver is a safe nebulizing liquid that you already have. Why nebulize? It’s not just lung support, it’s total respiratory support. When you nebulize, your eyes, sinuses, throat, and lungs all get some of that moisture, and if it’s colloidal silver, that immune support, too. When you’re fighting something, even if it’s a simple runny nose, you can feel a difference after breathing with the nebulizer. Many winter illnesses, not just flu, can cause a lingering cough, leaving you vulnerable to another infection (and irritated in your throat). Nebulizing regularly while you deal with it is another layer of comfort and protection. Set your nebulizer up somewhere comfortable and make it a once or twice a day form of prevention. Fit it into your day by multitasking some work, or use it as a break to support your immune system by destressing. Either way, make sure to get the most out of this tool this cold and flu season.